The Cathedral of St. John the Divine is one of the oldest buildings in Morningside Heights (a neighborhood in Manhattan’s Upper West Side) and is the home of the Episcopal Diocese of New York. The historic cathedral is not only one of the oldest buildings in the area – it’s one of the most secretive. A tour through the cathedral yields the perceptive visitor many visual treasures, from a rare gold triptych by Keith Haring (his last work before his death) to an unusual sculpture of the Archangel Michael, the decapitated head of Satan, and nine giraffes (!). The cathedral is home the largest rose window in the United States (the fifth-largest in the world), constructed from 10,000 stained-glass pieces. Other stained-glass windows depict historic, religious, and modern scenes. The cathedral is also one of the few buildings in Manhattan that allows visitors to access its roof, which provides a fantastic view of the New York City skyline. Visitors may also walk through the cathedral’s ‘biblical garden,’ where all the plants are species mentioned in the bible, and check out the peacocks, the impressive fountain, and the honeybees. Please note that there is limited access to the cathedral on Sundays – full access is only between 1 and 3 p.m. The grounds and gardens are open during daylight hours. The cathedral is wheelchair accessible from the upper driveway, on Amsterdam Avenue between 111th and 112th streets. Lifts inside provide access to eastern areas of the Cathedral. Hours: The cathedral is open 7:30am-6pm daily. The visitors’ center is open 9am-5pm daily. Get a bird's-eye view of the Big Apple with this 20-minute helicopter tour. Soar over all five boroughs, passing the Statue of Liberty, the Empire State Building, the Chrysler Building, Brooklyn Bridge, and more. Get an in-depth look at the thriving culture of Harlem during this 4-hour sightseeing excursion including the chance to attend a Gospel mass at a local church. Learn about Harlem’s religious side by attending a Gospel mass and touring the famous St. John the Divine church. You’ll also explore Harlem landmarks like the Apollo Theater, Sylvia’s restaurant, and much more. Experience the rich cultural legacy of Harlem and the soul-stilling rhythms of gospel on an immersive Sunday morning tour. Travel through the northern Manhattan neighborhood with a guide while learning about the history of the area and its landmarks like the Apollo Theater, Sugar Hill and Columbia University. Then, join a local Baptist congregation for a Sunday service featuring the exuberant vocals of a live gospel choir. The perfect introduction for new visitors, this in-depth bus tour covers top New York City landmarks in both Midtown and Uptown neighborhoods. Listen to entertaining live onboard commentary, plus enjoy personalized attention from your personal group guide at each designated stop, from Grand Central to Harlem’s iconic Apollo Theater. Tours also include skip-the-line admission tickets to the Empire State Building. 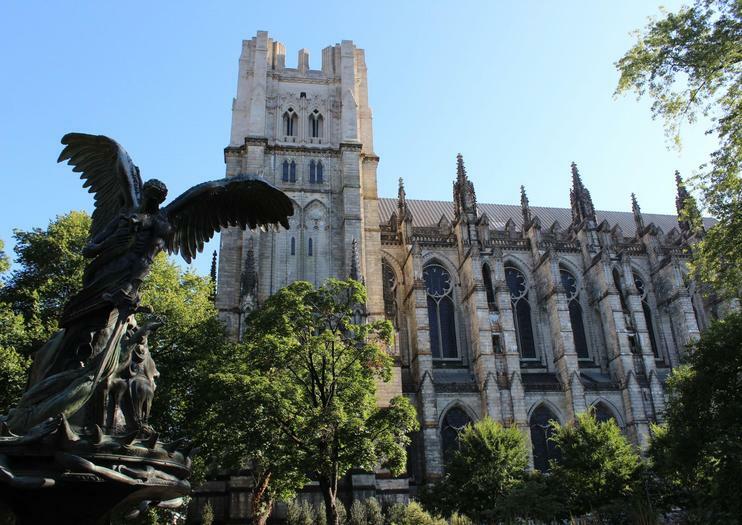 This tour will cross the Upper West Side, passing landmarks such as Saint John the Divine Cathedral, Columbia University, Ulysses Grant Memorial, Riverside Church and the Morris-Jumel Mansion. Travelers will get to know the history of Harlem, the legendary neighborhood known internationally as the Black Capital of America. We will also attend to an authentic worship with Gospel Choir while joining a local Baptist Reformed Church congregation. Cover more ground on this New York bus tour than you would on a walking tour, and be able to see more big attractions in less time. With a guide who’s familiar with the best routes to take to avoid the heavy NYC traffic, you’ll ride comfortably through the city as you learn about its history. You’ll also make stops, so you can get out and take pictures, too. Este tour es solo en Privado para Ud. pareja, familia y amigos.Vehiculo con capacidad hasta 14 pasajeros, disponible todos los dias de la semana, por la manana 08:00am por la tarde 14:00pmLa ventaja de este tour en Privado es que tendran a su disposicion a un guia profesional solo para Uds. This private walking tour offers visitors a terrific opportunity to get off the beaten path and explore a part of New York most tourists don't get to see. Not only will it be far less crowded uptown, but you'll get to see and learn about some incredible places, buildings, sculptures, landmarks, and history.You'll discover both America's largest cathedral (St. John the Divine) and its tallest church (Riverside Church), New York City's only "Ivy League" university (Columbia), the Harlem home of one of America's "Founding Fathers", Alexander Hamilton, the Gothic campus of City College, also known as the "Harvard on the Hudson", and Grant's Tomb, which was modeled on one of the 7 ancient wonders of the world. In short, this tour is great for history and architecture buffs, photo enthusiasts, and anyone else that enjoys sightseeing, neighborhood exploration, and getting off the beaten path. Servicio semi privado, con capacidad de 14 pasajeros por vehiculo, iniciando 09:00am este maravilloso tour, es para conocer el Norte, Centro y Sur de Manhattan y asi poder sentir la energia de la gran manzana, recomendado para aquellos que viajan por primera vez a Nueva York, Veremos Central Park, Plaza de Colón, Lincoln Center, el edificio “Dakota” donde vivió John Lennon, pasando por el Museo de Historia Natural, San Juan El Divino, considerada como una de las catedrales más grandes del mundo, La Universidad de Columbia, luego de norte a sur pasaremos por 5ta Ave, zona residencial, milla de los museos, Rockefeller Center y zona comercial apreciando tiendas muy famosas, luego llegaremos a la biblioteca pública, Empire State Building, Madison Square Park, Llegando a Greenwich Village, Soho que se caracteriza por sus galerías de arte y pintura, Chinatown muy conocido por sus imitaciones. El centro cívico de la ciudad, luego llegaremos al distrito financiero, Wall Street y Battery Park.